Learnt a string instrument once upon a time, but life got in the way somehow? 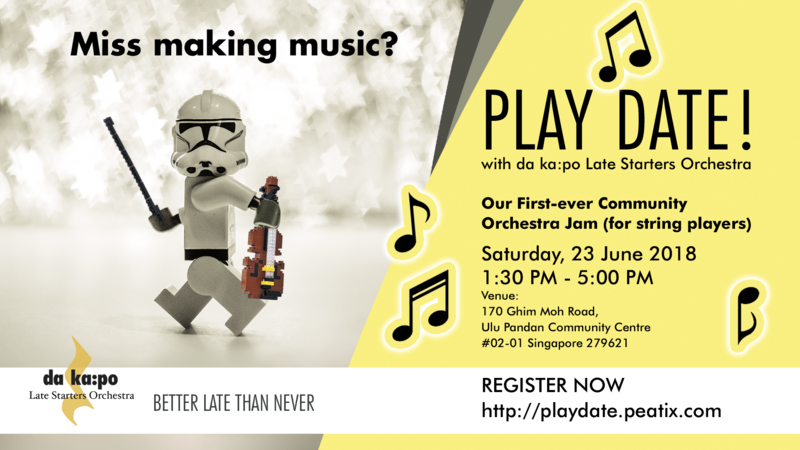 JOIN US for our first-ever community orchestra jam for string players. This event provides the occasion for you to make music again. Come as you are (with your instrument! ).You will not be alone in rediscovering your musical chops. We promise this, new friends and barrels of fun and laughter along the way. Sheet music will be issued ahead of time. Spend an afternoon working through music together with other music lovers. Our encouraging and inspiring conductor will be on hand to get us from bar one to the end. This event is open to all from ages 18 and above. Sheet music will be issued to registered participants via email ahead of time. No instruments will be provided, please bring your own.